When Saturday comes it's time for football and big races. We have our weekly taste of Hawkeye, below. And we have our football bet from The Alternative Punters Syndicate. The American Connection did the biz again with an 11/4 winner. And our own Daily Punt Lays bot had a good day also, by the way there are so many selections for the lays today that a bot really is necessary, including the place bets there are nearly 40 bets today. Anyway onto more interesting things. I've just finished reading this months Secret Betting Club newsletter and there's a few interesting things to report from that. Probably the most interesting is the interview with an odds compiler at a big, but unnamed bookmaker. One of the key points made which caught my eye was the advice not to bet in the eachway value races. IE those races where a short priced favourite skews the value on the other selections. Interesting to me because, although I don't go searching for these so am not on anything like all of them, I do always bet them if I spot one whilst searching out my selections. He also states that if you want to avoid having an account restricted then don't take early prices. Frankly there doesn't seem much point in having a bookies account if you can't take early prices! The other article of interest was an updated review and an interview with Paul Ruffy of Winning Racing Tips. 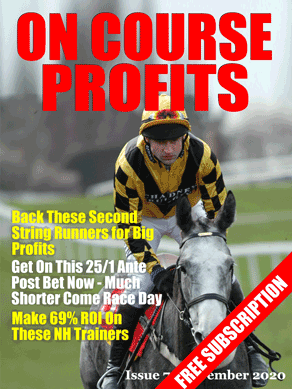 Winning Racing Tips has proofed 7 years of profit to the SBC and his interview makes for an interesting read. I've known Paul for all 7 of his years as a tipster and he is a straightforward and very honest guy, his service I would say is suited to the smallish stakes bettor who is betting to win and not just for fun – Winning Racing Tips. Find out more about the Secret Betting Club here.